Which is the decade of profligacy? Good morning, everybody. This morning, I sent a budget to Congress for the coming year. It’s a budget that reflects the serious challenges facing the country. We’re at war. Our economy has lost 7 million jobs over the last two years. And our government is deeply in debt after what can only be described as a decade of profligacy. The fact is, 10 years ago, we had a budget surplus of more than $200 billion, with projected surpluses stretching out toward the horizon. Yet over the course of the past 10 years, the previous administration and previous Congresses created an expensive new drug program, passed massive tax cuts for the wealthy, and funded two wars without paying for any of it – all of which was compounded by recession and by rising health care costs. As a result, when I first walked through the door, the deficit stood at $1.3 trillion, with projected deficits of $8 trillion over the next decade. It is true that 10 years ago we had a budget surplus of more than $200 billion, and that CBO projected surpluses “stretching out toward the horizon.” When CBO built its budget baseline for 2001, they had not yet accounted for the bursting of the late 90s tech stock market bubble and the effect it would have on federal revenues. Like families, businesses, and investors, CBO made a mistake: they projected future revenue growth that was never going to occur. Critics of the Bush Administration hinge their comparative argument on this single mistaken budget projection which in hindsight analysts from both parties acknowledge was wildly inaccurate. It is also true that President Bush proposed, and in 2003 the Congress passed and President Bush signed into law, a Medicare drug benefit that was not offset by other spending cuts or tax increases. It is true that this benefit significantly increased the already large unfunded liabilities of Medicare. Given my concessions, it must be true that the 00s were a decade of profligacy, and that President Obama’s policies will “restore fiscal discipline in Washington.” Right? Let us examine the results of these so-called “profligate” policies during the Bush Administration, and let’s compare them to the deficits proposed by President Obama. I will compare eight-year Presidential terms rather than decades. In doing so I will assume that President Obama gets a second term, and that the budget he proposed yesterday is enacted exactly as proposed. When doing this comparison one has to struggle with how to treat fiscal year 2009, which began October 1, 2008 and ended September 30, 2009. A traditional comparison would assign budgets for FY 2001 through FY 2008 to President Bush, and for FY 2009 through FY 2017 to President Obama, since usually the bulk of the laws signed in FY 2009 would be signed by President Obama. Here are the average budget deficits measured as a percent of GDP. As always, click on any graph to see a larger version. You can see that budget deficits during President Clinton’s eight years averaged 0.8 percent of GDP. Clinton folks will tell you this is because of his brilliant policies, and in particular the 1993 budget law. I think most of it is the result of tech bubble-induced higher capital gains revenues causing total taxes to surge to record levels. We can have that debate another time. If I measure President Bush for the nine year period 2001-2009, thus assigning almost all TARP spending to his Presidency, I get an average budget deficit of 2.7% of GDP. (Historical umbers are from OMB’s historical tables. Obama numbers are from Table S-1 in his new budget.) In calculating this nine year average I am adding the horrible FY 2009 into the Bush average, using CBO’s projection for the FY 2009 deficit of 8.3% when President Bush left office in January 2009. 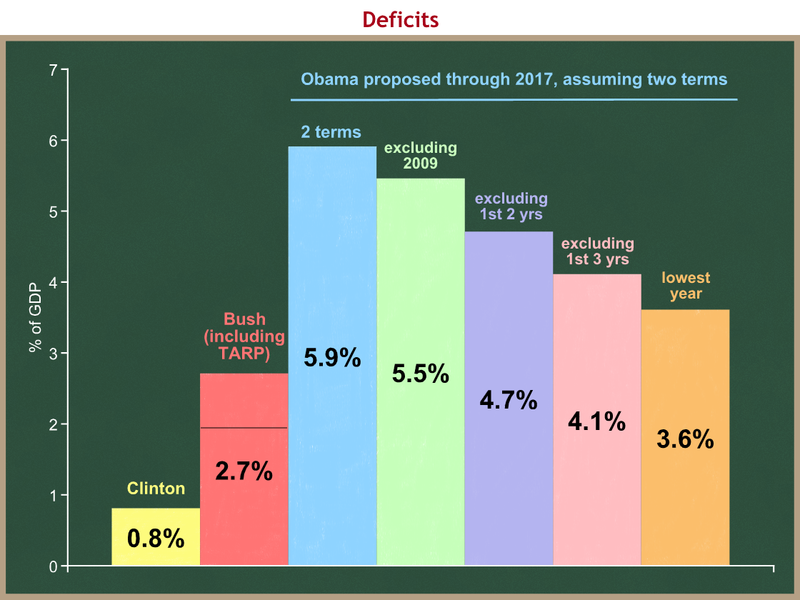 Bush therefore gets the deficit hit for most of the TARP, but Obama gets the hit for his stimulus law and the further economic deterioration when he was in office, both of which pushed the actual 2009 deficit to 9.9% of GDP. You can see a black line within the Bush column. That’s at 2.0%, the average Bush deficit for the eight year period of 2001-2008. Now let’s turn to President Obama. Remember, we are measuring his average budget deficit through FY 2017, assuming he stays in office for two terms and his new budget is enacted as proposed. I am also being generous by using OMB’s scoring of the President’s budget. CBO is always more pessimistic and would make the Obama numbers look worse. President Obama’s proposed deficits over the eight-year period FY 2009-2017 are 5.9% of GDP, the light blue bar. That’s more than twice as large as the Bush nine year 2.7% average, and almost three times as large as the Bush eight year 2.0% average. Update: This calculation assumes the full 9.9% FY 2009 deficit in the average, thus it includes the TARP spending and in a sense overlaps with the Bush red bar. The TARP money is being counted with each of them. The next three bars “solve” this problem by excluding all of 2009 (including TARP and stimulus) from the Obama average. I can imagine someone replying that it’s not fair to blame President Obama for the big deficits we are running as we recover from a severe recession. The next three bars therefore exclude the first one, two, and three years of an assumed eight year Presidency. Surely no one can argue that President Obama should not be held responsible for the budget deficits in years four through eight! You can see that each of these comparisons, which allow you to “not count” the recovery years in the average for Obama, still result in average budget deficits that far exceed even the worst portrayal of the Bush Administration’s average. In fact, the smallest annual deficit proposed by President Obama is 3.6% of GDP, in 2018 and 2019, the two years after his second term would end. The lowest during his hypothetical eight years would be 3.7% in 2017 and 2018. The lowest proposed budget deficits in a hypothetical “Obama decade” would exceed the Bush average budget deficit, even if we assign most of the TARP spending to Bush.